Excellent set all the way around. Very easy assembly with straightforward instructions. Set is of high quality and appears very sturdy and heavy duty. Very satisfied with the quality, value, appearance, and utility. Looks great on our patio. A classic, homey feel has arrived with this five-piece patio furniture set from International Caravan. 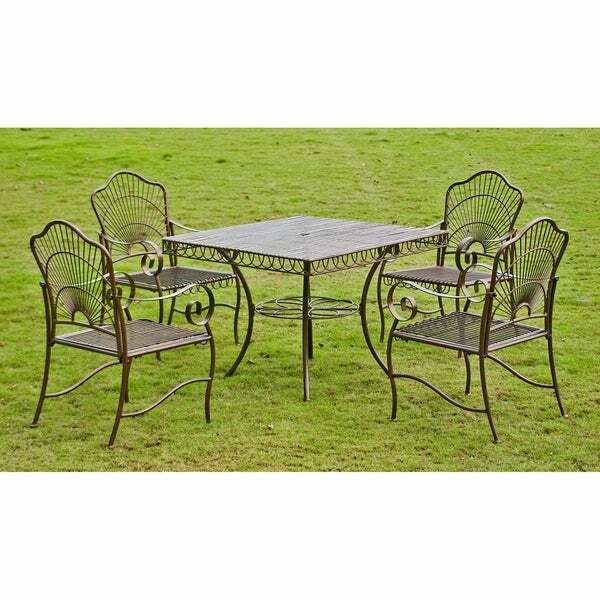 This iron furniture set is weather resistant to withstand the elements as it offers comfortable sitting for an outdoor breakfast, tea or lunch. Gather your friends and enjoy a relaxing chat on the patio with these durable table and chairs. I am a 65 yr. old woman and I had no problem putting this set together - it feels solidly built and I loved the color - my only negative would be that the slats in the table top are a little far apart and things tend to fall through - like pens, etc. but you can put place mats or a cloth to prevent that. Hint - when buying from Overstock pay attention to the reviews - that is how I chose this one - some of the reviews on other sets were not all good. Excellent quality. Sturdy and surprisingly level. Attach fittings slightly bent but still tightened very well. Hardware sturdy with extras included. The finish is smooth and assembly was very easy. Recommend constructing table support frame before attaching to table. Shipping was really fast. Too fast, almost had to rearrange Christmas plans due to fast delivery from Texas. American made product that has impeccable quality. Highly recommend. The International Caravan Sun Ray Five-piece Iron Lawn Furniture Set is as beautiful in person as it was in the picture. Very sturdy, great quality. It was very easy to put together also. If you purchase this set you will not be disappointed. The photos do not do justice to this patio set. It is very heavy and sturdy despite looking delicate and fragile in the pics. It was easy to assemble, is comfortable (with the addition of cushions), and is gorgeous. The color is a deep brown and the table is square with an umbrella hole, which is also not very obvious in the pics. 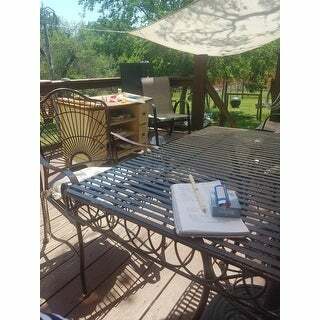 We are thrilled with this patio set. Great quality especially for the price! The International Caravan Sun Ray Five-Piece Iron Lawn Furniture Set is quite lovely. I don’t find it very comfortable, though, even with cushions and pillows. Also, the chairs don’t scoot in far enough, resulting in a bulky mess. Being called a "game set" (on the box) or "lawn furniture set" (overstock) instead of "dining set" made me wonder if this was going to be an awkward height or something. I don't know why they can't technically call it a dining set, but as far as I can tell, it is a dining set! 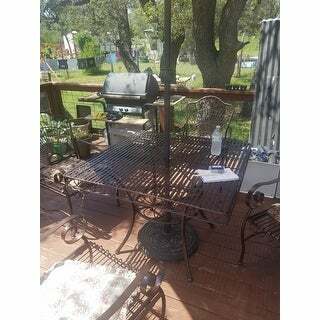 Hole for umbrella, table has feet that can be adjusted to allow for slightly uneven ground, table size has plenty of room for 4 to dine without overlapping plates or anything. A great set - the feet all have pads so that you aren't scraping iron legs on concrete. Color is nice. Assembly was fine - just use the shorter screws for the table top-leg connection, the longer screws for farther down on the table legs (not mentioned in instructions). Highly recommend. Fell in love with the sunburst pattern & had to have this set for our patio! Chairs were a breeze to put together, but the table took longer to line up the legs with the stablizer (hint: put together legs & stablizer first, then attach to table top). Chairs just need a seat cushion to make them more comfortable. We also have the swing (which Overstock quickly sold out) & the loveseat conversation set as well. I have had this furniture set for quite awhile. It is durable, still looks like new even though it is outdoors all the time. People tell me that it is very comfortable and it looks more expensive than it really is. I recommend it highly. We are very pleased with this set! It looks good, is sturdy and comfortable and it was easy to assemble. We have it on our front porch and have received many compliments! Look exactly like the picture. No flaws and beautiful. Seats are roomy and very comfortable. I like how this set is made and how sturdy it is. It isn't like the plastic sets that break easily with too much weight. This set has stood up well and looks nice in my yard. Would buy it again. Love the size and color! Very sturdy. Should last for years!! I've had a lot of friends ask where we got it from. VERY heavy duty. We have very high winds in New Mexico, I'm able to leave it out year round. Would absolutely purchase again. "What is the weight of the table, and the weight of a chair?" "I'm confused with what is stated to be the chair dimensions. I get the 23" wide and assume that the 36.5" height is from the bottom of the legs to the top of the back of the chair. If that is correct, I can't imagine a chair that is 41" long from the front of the seat to the back of the seat. Can someone please explain what exactly the measurements are indicating?" The dimensions are the overall dimensions of the chair. Sorry for the confusion. We will fix the description. Please fix ALL dimensions on ALL the products. They're often very confusing and just.....wrong. I'm not going to order sight unseen unless I can get a CLEAR understanding of size. You realize how important that is, right? I pass on products with size-descriptions that are ridiculous or just messed up like that. It makes you lose confidence in the product itself. Do you have a proof reader? If so, maybe they need re-training. Please help all your shoppers by getting the descriptions/dimensions right. We shouldn't have to read every review and question just to know how high a chair-back is. Thanks. "do the seats accommodate larger sized people? Over 200 lbs?" Hello Robyn B., we do not currently weight test items. We apologize for any inconvenience. Thank you for shopping with us. "Does this set have space for an umbrella? Thanks!" Hello Misha99, the table does feature an umbrella hole. Please let us know if you have additional questions. Thanks for shopping with us. "Before I purchase I would like to be sure that this does not rust. I just returned a set with another company because of rust after only 3 months. Thank you." Hello Yvette, this set should not rust. We never had other customers complaining of this happening. I hope this helps. Please let us know if you have any further questions. We wanted a sturdy iron set and the reviews were very good. The price was also great for wrought iron! I bought the matching rocking chairs several months ago, and they proven to be both sturdy and beautiful. I have been looking for the perfect patio dining set for awhile, and I am looking forward to some delicious and relaxing meals by the pool. "Morning! Does it say the weight limit for these chairs? Thank you for your time!" Hello theflinnstones, Overstock does not weight test Items; however this type of chair typically holds 200 to 250 pounds. Thank you for shopping with us.